A balcony isn't just for standing on and declaring yourself master of your domain. 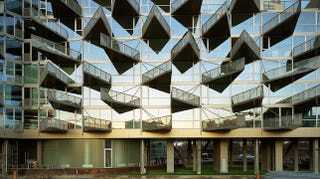 It's also a beautiful architectural feature that can turn an ordinary building into something fantastic. These are some of the most amazing balcony designs we've ever seen. The early-20th century Hample and Avenue Buildings were renovated by 5468796 after they had stood empty for almost two decades. The construction is set to begin next year. Or why don't you use your balcony as a garage like these in Kiev, Ukraine and Russia?